Squeeze one lemon into a bowl of water and toss in the peels too. Trim the artichokes: Pull off several layers of outer leaves until you reach the more tender ones inside. Cut cross-wise through the artichoke about 1 inch from the base. (Artichokes vary enormously; if yours are small, young and tender, you can leave more of the leaves on, perhaps just cutting off the top inch.) Trim the stem so that just 1 inch remains. Use a paring knife to trim off the tough dark green skin from the bases of the leaves and the stem. Cut the artichoke in quarters lengthways and use a teaspoon to scoop out the hairy choke. Place immediately in the bowl of acidulated water to minimise discolouration. Meanwhile finely chop the leaves and tender stems of the parsley and oregano. Peel and mince the remaining two garlic cloves and mix them with the chopped herbs, grated Parmesan and breadcrumbs. Heat the oven to 180C and lightly grease a gratin dish with olive oil. When the artichokes are cooked, use a slotted spoon to lift them out and into the gratin dish. Catch some of the garlic too if possible. Season them with salt and pepper. Boil the braising liquid hard for a few minutes to concentrate the flavours. 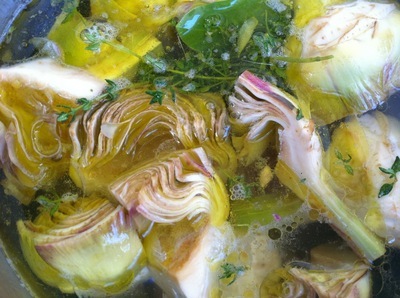 Moisten the artichokes with a ladle-full of braising liquid (around 150ml), then scatter over the herb-breadcrumb mix. Finally drizzle a several tablespoons of olive oil over the breadcrumbs. Bake for around 25 minutes or until the gratin is bubbling and browned on top. Serve hot or warm.